This chart compares the specifications of the major brands of the mini lathe. Bold rows highlight what we feel are significant differences, rather than mistakes or variations in measurement. Chuck Diameter 4" 3" 3" 3" 3" 3"
All the mini lathes listed on this page are made in the same factory in China. Except where they have different features, the parts are interchangeable. In our experience there is not a noticeable quality difference between the brands. 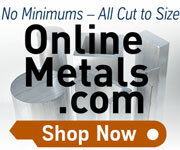 The LittleMachineShop.com models 5100 and 5200 HiTorque 7x16 Mini Lathes are the best in their class. They have the most power, most torque, and a longer center distance than other lathes in their size range. The 500 Watt (0.67 hp) brushless spindle drive motor provides tremendous low-end torque. And you can vary the speed from 50 RPM to 2500 RPM continuously in both directions. There are no gears to shift. The cross feed and compound rest dials are graduated in 0.001" and 0.025 mm. The lathe is equipped with a 4-way indexing tool post set for 5/16" (8 mm) tools. Real top and bottom half-nuts and a reversible 16 TPI lead screw provide extended threading capability. You can create every American Standard Unified class 2A inch screw thread from 4 to 100 threads per inch, and you can create every American Standard Metric class 6h thread from 0.25 to 8 mm pitch with the extra 21 tooth change gear that is included. The Grizzly model G8688 is a 7x12 mini lathe. The Grizzly mini lathe comes with more accessories than most of the other mini lathes, including a faceplate, steady rest, and a 2 Morse taper dead center. Harbor Freight Tools sells two versions of the mini lathe. The Central Machinery model 93212 mini lathe is a 7x10 mini lathe. (Harbor Freight uses a different kind of ruler from everyone else when measuring their 7x10 mini lathe because it is actually 4 inches shorter than the 7x12 mini lathes.) The Central Machinery model 93799 mini lathe is a 7x12 mini lathe. This is the same size as all the other 7x12 mini lathes. Harbor Freight includes a 2 Morse taper live center with their mini lathes. The earlier version of the Harbor Freight 7x10 mini lathe is model 33684. The newer versions have some additional guards, but are basically the same machine. LittleMachineShop.com carries the SIEG C3 mini lathe. The SIEG C3 mini lathe is a 7x14 mini lathe, which is 2 inches longer than the Grizzly and Harbor Freight 7x12 mini lathes, and 6 inches longer than the Harbor Freight 7x10 mini lathe. The SIEG C3 mini lathe comes with a 2 Morse taper dead center. The motor on the SIEG C3 mini lathe is also larger than most other mini lathes; 350 Watts to the other's 250 Watts. And, the SIEG C3 mini lathe has a lever-lock tailstock, while most of the others require that you tighten a nut to lock the tailstock. Micro-Mark carries the MicroLux model 84631 7x16 mini lathe. This is the longest mini lathe available. It has the 500 watt brushless DC drive system and a lever-lock tailstock. The cross slide and compound rest dials both advance 0.050 inch per revolution. Homier Mobile Merchants previously distributed the Speedway model 03911 mini lathe. The Speedway mini lathe is a 7x12 mini lathe. The Homier mini lathe came with a 2 Morse taper dead center. ToolsNow.com (Cummins Industrial Tools) previously distributed the model 5278 mini lathe. The ToolsNow mini lathe is a 7x12 mini lathe. The ToolsNow mini lathe had more accessories than any of the others, including a faceplate, a steady rest, a follower rest, a 2MT dead center, and a tailstock drill chuck.